We are now at the point in the bull market where traders think that stocks are bullet proof. Back in December I warned this was coming. I said at the time that this round of QE was going to be different. That it would have a much bigger effect on the market than the analysts were expecting. I remember at the time analysts were claiming each round of QE was having less and less effect. 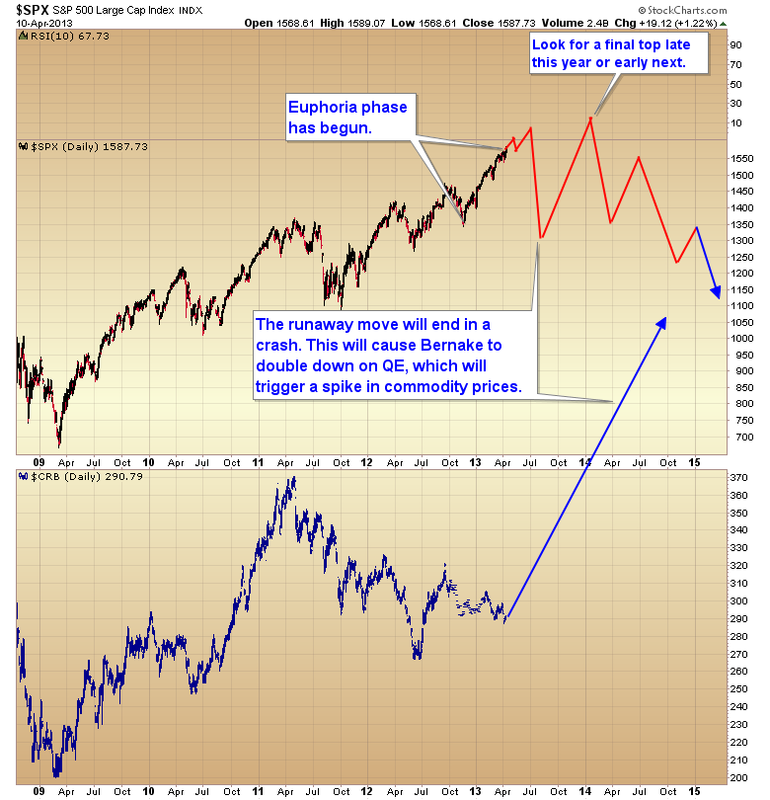 QE infinity has, and is, generating a runaway move in the stock market. The problem with a runaway move is that it's artificial. Let's face it, anyone with a shred of common sense knows what's driving this move and it isn't the economy. Bernanke is crazy if he thinks the stock market is acting normal. Well, this is the guy that said the subprime crisis was "contained." Any artificial move is destined to end badly, just like the artificial housing market ended badly. And that's exactly how these runaway moves end. At some point all of these nervous investors try to get out the door at the same time and you get a crash or semi-crash. My best guess is that it will come in June or July. Until then the market will probably continue to creep higher with occasional 40-50 point corrections. That's another characteristic of runaway moves. They set a standard correction size early in the move and all corrections there after fall in the range. Then at some point one of those corrections spikes through the range and months of gains get wiped out in a matter of days, or even minutes. The flash crash in 2010 is an excellent example of a runaway move crash. So here's what I think is going to play out. Unknowingly, Bernanke has put in motion a runaway move that will end in some kind of crash this summer. Depending on how long and far above the 200 day moving average this thing stretches will determine how violent the crash will be when the forces of regression take over. If this lasts till summer, as I think it could, we could see a crash of 15%-20%. When that happens Bernanke is going to freakout and crank up the printing presses even faster. $85 billion may become $150 billion. When that happens, commodity markets are going to go crazy just like they did in 2007/2008 as Bernanke tried to print away the real estate implosion. When commodity prices spike, economies collapse...just like they did in 2008. All the pieces are starting to fall into place. QE infinity is driving a runaway move in stocks that will end like all runaway moves, with some kind of crash scenario. That will trigger even more printing which will spike commodities next year, and that will be the end of the economy and the beginning of the end for this stretched and extended cyclical bull market. Look for a final top late this year or early in 2014 and a much extended topping process as the fundamentals slowly overwhelm Bernanke's printing press.